The scene of the explosion at Hamiltonsbawn in 2014. Police have welcomed the sentencing of a man in connection with an explosion at an ATM machine in Hamiltonsbawn. He was sentenced at Newry Crown Court, sitting at Dungannon courthouse today (Thursday, March 15), in relation to conspiracy to cause an explosion likely to endanger life or cause serious injury to property. Ioan Anton (40), whose address was given to a previous court as Terryglassog Road, Dungannon, was sentenced to two years - one year imprisonment and one. year on licence. 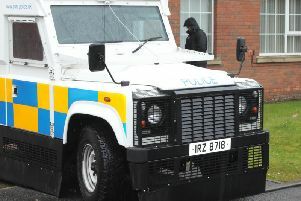 A co-accused, 41 year old Gratian-Ioan Pinter, had previously been sentenced to three years imprisonment, with three years on licence, for causing an explosion likely to endanger life or cause serious injury to property, and three years, with three years on licence, for attempted burglary, at Newry Crown Court on 17 October 2016. Anton and Pinter were arrested following the attempted theft from an ATM machine at a filling station on Annareagh Road, Hamiltonsbawn during the early hours of Thursday, June 5, 2014. Around 2.30am police received a report of a loud bang in the area and suspicious activity close to the ATM. Officers attended and discovered a suspect device involving gas had exploded close to the ATM. ATO were tasked and the device was made safe and removed for further examination. Anton and Pinter were arrested later that day and an extensive police investigation involving assistance from law enforcement authorities across Europe has ensued since. The investigating officer Inspector Will Brown said: “This was a protracted investigation led by detectives from Criminal Investigation Branch. We will continue in our efforts to make Northern Ireland a safer place to live and work by proactively investigating and arresting people involved in criminality. “Ioan Anton and Gratian-Ioan Pinter became involved in criminality and as a result are now in prison. “The sentence handed to them at court should act as a deterrent to others. We will continue to actively seek out these individuals and bring them before the courts.